Jazz pianist extraordinaire, John Eaton, charmed and entertained over 100 delighted Village members and their guests on Tuesday evening, March 24th. Mr. Eaton delivered renditions at a Steinway piano of cherished American songs by composers such as Cole Porter, George Gershwin, Jerome Kern. 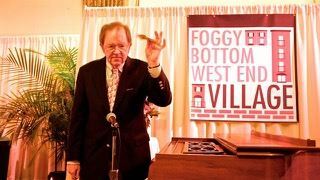 The second level of the Foggy Bottom West End Village campus was turned into a jazz club for the event. After a short social hour, all attendees settled down to a musical tour down memory lane and marveled at Mr. Eaton’s talent and ability to compose jazz combinations on the spot from suggestions taken from a very enthusiastic audience.